Professor Charles Spence once won the Ig Nobel prize for his work on the crunch sound crisps make and how this gives clues about how stale they are. The Ig Nobel honours achievements that make people laugh and then think. 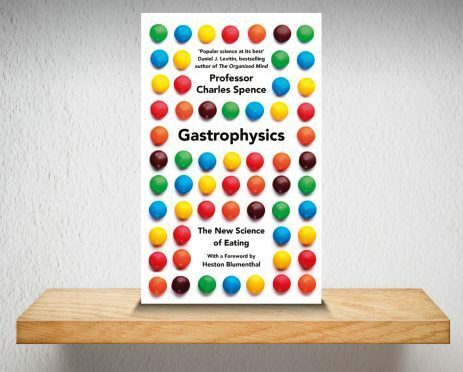 This book is packed with new ways of thinking about food and eating. Spence shows how we eat with our minds as well as our mouth. He reveals the impact that smell, sound, sight and touch, as well as taste, have on our perception of what we are eating. You’ll discover why certain shades of food or plate will make food taste sweeter, how the arrangement of salad on the plate affects the price customers are willing to pay for it and why upmarket restaurants are Googling their customers before they arrive. Foodies will discover new ways to make their dinner parties more memorable and couch potatoes will find out why they eat more while watching TV. This quirky book makes compelling and revealing reading – and provides plenty to digest.